Spain’s top criminal court is to investigate claims that members of a far-right political party in Spain had been subjected to “torture” under the order of Gibraltar’s chief minister, Fabian Picardo, after they were arrested in June for unfurling a Spanish flag on the Rock of Gibraltar, the Gibraltar Chronicle and other publications are reporting today. In a statement, the chief minister dismissed the legal proceedings against him as “frivolous and vexatious and a clear abuse of process”. “In addition, these proceedings are a slur on the excellent reputation and work of Her Majesty’s Royal Gibraltar Police, Her Majesty’s Prison Service and the Gibraltar Magistrates’ Court and legal system, all of which I have complete confidence in,” Picardo added. Whether or not the case is “frivolous”, it is likely to be seen as further evidence of the continued high tensions between Gibraltar and Spain, in the wake of the UK’s vote to leave the European Union. Even before the Brexit vote in June the relationship between Gibraltar and Spain has always been tense, since Spain has long argued that Gibraltar ought to be a part of Spain, owing to its location on its southern coastline, but Britain has claimed sovereignty over the Gibraltar peninsula since 1713. Earlier this month, the former UK foreign secretary, William Hague, told a gathering in London that Spain could look to stake a claim for joint sovereignty over Gibraltar during the forthcoming Brexit negotiations. In its report today, the Gibraltar Chronicle notes that “a judge at the Audiencia Nacional in Madrid has admitted for process a formal complaint filed by VOX [a far-right political party] alleging ‘torture and crimes against moral integrity’, for the way two of its members were treated by authorities in Gibraltar”. As reported here in June, the right-wing Spanish pranksters unfurled a giant Spanish flag on the side of Gibraltar’s famed “Rock” a few days ahead of the Brexit vote, which was a time of considerable attention in the British outpost, and thus caused a stir. “Royal Gibraltar Police have now removed a Spanish flag which had been unfurled on the Rock, which has been British 300+ years,” one Gibraltarian tweeted at the time. 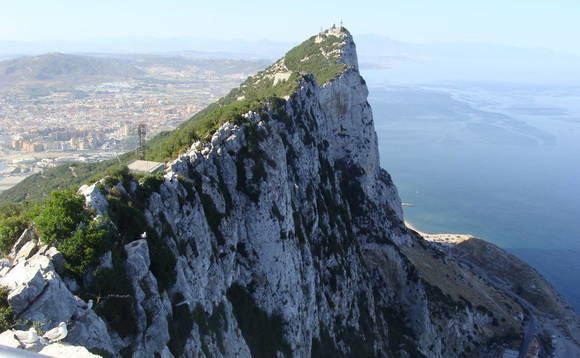 The stunt followed a declaration by the Spanish government the previous week that Gibraltar would “remain Spanish”, whatever the result of the Brexit referendum.